Vermiculite and gypsum, for internal use. It is a lightweight coating that provides very efficient fire resistance with minimal thickness to steel and concrete frames, metal floor and roof decks and to return air plenums. 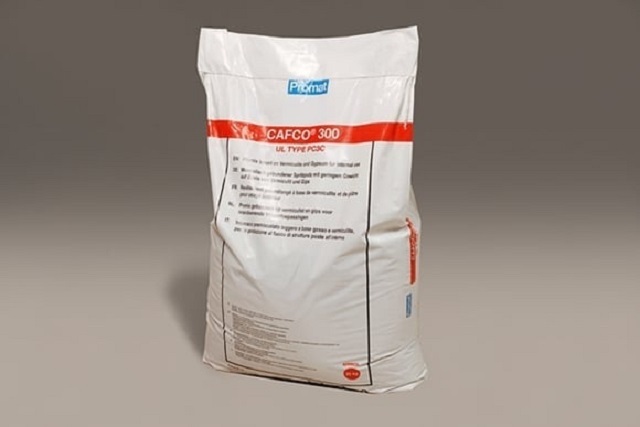 Structures protected with CAFCO® 300 can provide fire resistance for up to 240 minutes. Building types that will benefit from the use of CAFCO® 300 include educational, leisure and entertainment centres and commercial projects. Colour and finish: Off-white with a monolithic spray texture. Theoretical coverage: 217 m²/tonne at 15 mm thickness. Number of coats: One or more as required. Initial set: 10–15 hours at 20°C and 50% RH without accelerator. Density: 310 kg/m³ (±15%) without accelerator, approximately 10% less with accelerator. Bond impact: No cracks or delamination to ASTM E760. Air erosion resistance: No erosion to ASTM E859. Compressive strength: 1.22 kg/cm² to ASTM E761. Deflection effect: No spalling, delamination or cracking to ASTM E759. Flame spread: Class 0 as defined by the Building Regulations. Corrosion resistance: Does not promote corrosion of steel. However, a primed substrate is recommended for long term corrosion resistance. Promat UK operates a quality system in accordance with BS EN ISO 9001: 2000 and has received full accreditation to these standards. Structures protected with CAFCO® 300 have undergone extensive fire resistance tests up to 240 minutes in approved independent laboratories to recognized standard BS 476-21. The thickness of the fire protection for a given period of fire resistance in a cellulosic type fire relates to the A/V ratio of the section. For advice on thickness calculations for hollow sections, cellular beams, castellated sections, composite floors, upgrading of concrete slabs and more complex situations, please contact Promat UK. The product information below is from the NBS Plus library of product clauses offered in NBS specification products. It has been created by NBS for Promat UK. Each product clause is authored in NBS format and is intended for inclusion in project specifications. Please note that NBS product guidance is not a replacement for the manufacturer's literature and it is recommended that Promat UK be consulted before specifying.